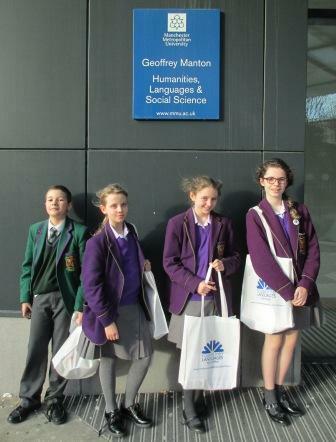 On Wednesday 19th March, four of our Year 7 pupils – Ava Dagnall, Isaac Samuel, Eve Whittle and Jenny Young – went to Manchester Metropolitan University to take part in the Routes into Languages Spelling Bee Final. They have been taking part in the competition in their Spanish lessons since September and have so far learnt 150 words which they can spell out in Spanish. Over 11,000 pupils in the North West entered the competition, so our pupils did extremely well to reach this stage. Competition at the Regional Final was tough and, despite admirable performances, our quartet did not manage to reach the grand final. Nevertheless, everyone enjoyed themselves and left Manchester with a prize and a blossoming love of languages.